Round 2 Of Week #4...Yes, It Gets Better! Many of you are taking to my blog. I'm glad you've become addicted. Aside from the millions I make for writing, "Off Prompter," hearing from my loyal fans is truly what makes this so worth while. Therefore, I'm ready to unveil my latest round of picks for week four in college football. Are you ready for some UPSET SPECIALS??? As always, this blog entry will provide picks for CUSA, Independents, Mountain West, Pac-Ten, SEC, Sun Belt and WAC. If you're raging mad because you can't find your favorite conference - TAKE A BREATH - and simply go back and read my previous post. There you will find my predictions for the ACC, Big 12, Big East, Big Ten and MAC. Once again, I'm trying to bounce back from my worst record of the young season...47-19. CONFERENCE USA: 7-3 last week, 21-8 overall in this league. *After almost beating the Texas Longhorns, the Knights are a LOCK to collect their first win at their new stadium. As many of you know, I've been very high on Memphis this year and I think they're improving, but after the fans in Orlando watched the LONGHORNS almost lose to their hometown team - they'll be out in full force to help the Knights continue what is becoming a breakout year. *It's never easy picking a road team in CUSA. Teams in this league hold their turf well. The reason I'm taking the Rams is they're sooooo due!!! After going to overtime against rival Colorado and losing - giving CAL a heart-attack in Fort Collins and falling just a few points short, Sonny Lubick's team will not be denied by the Cougars. I am worried about CSU's pass attack with TE Korry Sperry out for the year. Still, RB Kyle Bell is a workhorse and he'll be the difference in this CUSA battle. *No stats provided until you beat a real opponent. *Poor Mustangs. They don't have a prayer against a group of highly pissed Horned Frogs. Seriously, how in the WORLD did Air Force win that game? HC Gary Patterson is done thinking about the Falcons and now wants to make this year's battle for the "Iron Skillet" a statement game for TCU. Freshman QB Andy Dalton is about to become the star for TCU's offense for years to come. As for SMU, QB Justin Willis is becoming a ball-hog. He needs to share the pigskin more. *Watch out for sophomore WR Fred Rouse. Remember this kid? He was labeled, "The next Randy Moss" by recruiting expert Tom Lemming. He went to Florida State and was arrested for breaking into Lorenzo Booker's apartment and stealing some of his possessions his freshman year. UTEP welcomed him with open arms and if the kid can keep his head on straight, could blow up in this league. INDEPENDENTS: 3-1 last week, 10-2 overall. *The Blue Raiders finally get in the win column! They deserve this after a grueling non-conference schedule that featured TWO top ten teams (Louisville and LSU). Expect sophomore RB Phillip Tanner to explode in this non-conference classic. MOUNTAIN WEST CONFERENCE: 3-4 last week, 14-9 overall in this league. *An instant classic! The Falcons end a three-game losing streak to the Cougars in PROVO! Just like Falcon players, I believe in first year head coach Troy Calhoun! Aside from Nick Saban, no coach has done more in their first three weeks at a new program. Last week's win over TCU wasn't the biggest story in my opinion...it was the stat sheet. QB Shaun Carney recorded a career high in passing attempts with 28 and tied his career high in completions with 17. His previous high was 22 attempts last season vs. Utah. Troy Calhoun wants to eventualy throw the rock constantly, at this pace - he'll accomplish that feat sooner than many expected. *FINALLLLLLLY!!!! Poor Chuck Long, he didn't know what he was getting himself into when he left Oklahoma. *About as easy of a win you can find for the Lobos who are fine-tuning their game for the confrerence slate next week. *There is no way Utah loses this game after their unthinkable performance in week three. The Rebels are hungry for a win after looking terrible against the high-powered offense of Hawaii. Which UNLV will show up? The Wisconsin Rebels? Or the Hawaii Rebels? Bottom line, both lost. PAC-TEN CONFERENCE: 6-4 last week, 20-7 overall in this league. *I still think the Bears will win the Pac-Ten. Beating Tennessee on the road is still a great win, I don't care what the score was in Gainesville. QB Nate Longshore is only averaging 20 completions per game so far and DeSean Jackson only has 112 yards recieving in three games. Those stats will be inflated this week in Berkeley. The MVP of the Bears so far this season is clearly RB Justin Forsett. This senior is on pace to rush for 1500 yards!!! As for Arizona, QB Willie Tuitama had a big week three and is having very good season, unfortunately HC Mike Stoops can't generate a running game to keep safeties honest. *The USC passing game is suspect. 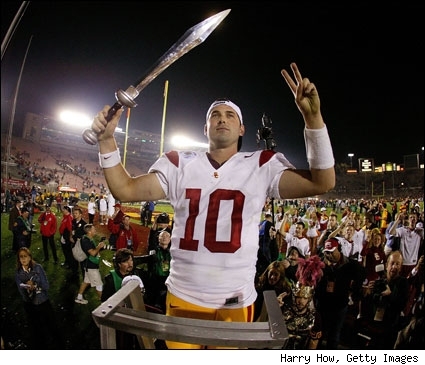 ANYONE who has QB John David Booty as a Heisman frontrunner must be a Trojan fan. I understand the Trojans are all about their plethora of running backs, BUT at some point this untested receiving corp must prove it can provide the "big play." Keep in mind, Washington State lost by just six points last year in Pullman and have spent the offseason waiting for another crack at the nation's number one team. *What's been overlooked so far this season is the Arizona State defense. The Sun Devils are giving up a slim average of 10 points per game and are allowing under two yards-per-carry against the run. 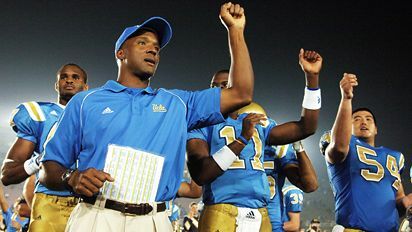 HC Dennis Erickson has created a Pac Ten sleeper in ASU and is doing a great job in the way he's used QB Rudy Carpenter. The offense isn't based around the Devils starting quarterback which means turnovers are down and Rudy is gaining confidence. Injured RB Ryan Torain will not play, but Keegan Herring is just as good - if not more well rounded. Oregon State will continue to struggle until they commit to Sean Canfield as their one and ONLY quarterback. Their are "starters" and "backups" - not "primaries" and "secondaries." The QB shuffle doesn't work...this game will be a perfect example. *When thinking of the Pac-Ten, three teams have shots at BCS Bowl Games. Oregon is one of them. The Ducks will blow this game wide open in the first half, leaving QB Dennis Dixon on the bench for the second. Stanford is making strides, slowly but surely. *One week ago I thought this would be one of the best games in week four. It lost some serious luster. With Washington unable to generate any offense against Ohio State and UCLA getting embarrassed by Utah I had to think long and hard about this one. My conclusion is the Bruins are playing for their coaches job - and they know it. Washington isn't worried about the status of Ty Willingham and that element alone will be the difference in this one. SOUTHEASTERN CONFERENCE: 6-2 last week, 21-5 overall in this league. *The easiest pick of the week. Tim Tebow is awesome. *Not the blowout so many expect! Without WR Early Doucet (injury), the Tigers have a hard time spreading the field against the 2nd best defense in the SEC. QB Matt Flynn struggles for the Tigers and will be replaced in the second half by Ryan Perrilloux - who started last week and was amazing. Sounds like a quarterback controversy to me! South Carolina has a sub-par offense without LSU being their opponent. The Gamecocks offense may as well stay home. *The magic continues! This game is a showdown between the NFL's #1 and #2 overall draft picks. Woodson and McFadden are incredible talents that will show up and put on a college football show. HC Houston Nutt is looking over his shoulder after this loss. *The Bulldogs don't have a quarterback, but they do possess a 3-1 record following this victory. After years of losing - HC Sylvester Croom can live without throwing the ball for awhile. RB Anthony Dixon is a workhorse and will run downhill all night long this weekend. *Gotta be honest, thought about making this one an upset special (for one second, I promise). Tennessee returns home after the most embarrassing SEC loss in years. Problem is, Arkansas State is good! Almost beat Texas, dismantled SMU and will keep up with the Vols for three quarters. Tough times ahead for HC Phillip Fulmer, three of the next four opponents are ranked. *Great game! 'Bama is riding the confidence instilled by Nick Saban and the result is a group of players that may be overachieving. 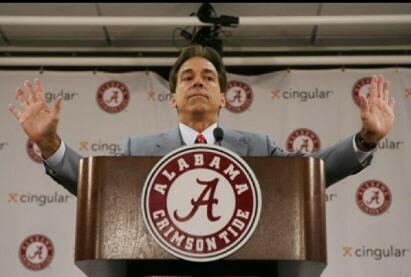 I gotta be honest, I was skeptical about this whole "Saban can do no wrong" mantra the fans in Tuscaloosa have had since his arrival. 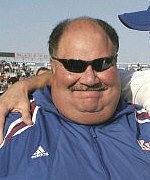 But, the guy is one helluva coach. The Tide can compete with anyone in this conference and this game will exemplify that notion. SUN BELT CONFERENCE: 4-3 last week, 16-5 overall in this league. *If Troy loses this game, the Trojans will become the most haywire team ever! After a non-conference schedule most teams would roll over and play dead after, Troy is ready to make a statement as the best team in the Sun Belt Conference! QB Omar Haugabook is so good lately - he's NASTY!!! *NTU hasn't won a game coming in and FAU is feeling saucy after upsetting Minnesota. So WHYYYY am I picking the Mean Green??? Two reasons. #1 They've never beaten FAU and they're due. #2 It's their home opener - which means fans in Denton can welcome back WR Casey Fitzgerald who racked up 18 catches for 327 yards and 2 touchdowns versus SMU LAST WEEK!!!! IN ONE GAME!!!! QB Danile Meager hooked Fizty up with those yards - all part of 601 YARDS HE HAD TOO!!!! This is North Texas' year! WESTERN ATHLETIC CONFERENCE: 9-0 last week, 25-1 overall in this league. *Quick! Name the Charleston Southern mascot!.........Neither could I.